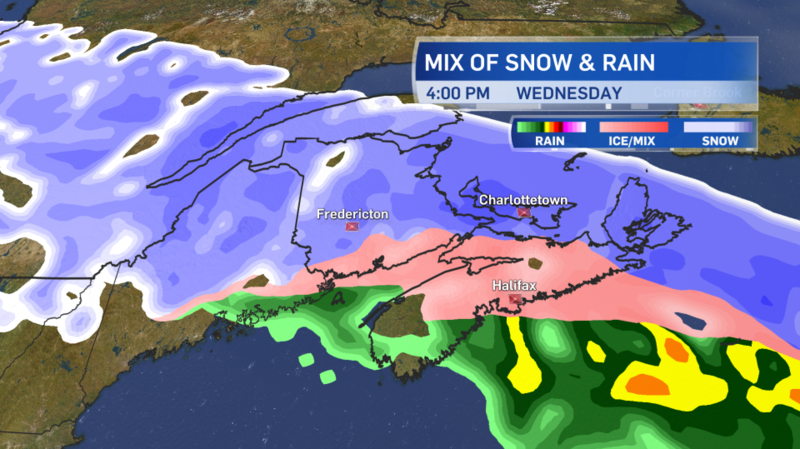 The Maritimes will be contending with snowy roads Wednesday morning with some areas turning over to rain through the day as a strengthening low pressure system moves up from New Jersey and across the region. Snow for most of the Maritimes will begin before and near sunrise on Wednesday. Since surfaces are frozen and cold it will begin to accumulate from the start. By the afternoon and evening, the precipitation in Nova Scotia, Prince Edward Island, and southern areas of New Brunswick will turn to a mix of ice pellets and rain. Central and northern areas of New Brunswick are the most likely to continue getting snow. The inclement weather will mostly clear Wednesday evening. Lingering flurries will trail behind the storm for Thursday. Those areas that do get above freezing on Wednesday will return to below freezing by Thursday morning so wet or slushy surfaces will turn icy. 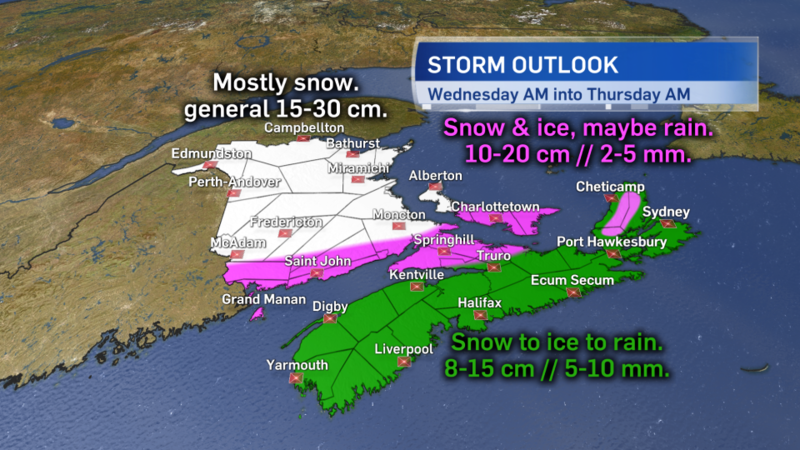 Due to the mix of precipitation in the forecast, snowfall amounts will be varied across the Maritimes. Northern and central areas of New Brunswick will see 15 to 30 centimetres of snow. Southern areas of New Brunswick, Prince Edward Island, northern mainland Nova Scotia, and the Cape Breton Highlands look more likely to see 10 to 20 cm along with ice pellets and rain. The rest of Nova Scotia will get 8 to 15 cm with a quicker turn to ice pellets and then rain. A shift east or west in the path the storm is projected to take through the Maritimes will impact snow amounts in the forecast. Easterly winds will increase through Wednesday morning to gust to between 40 and 70 km/h by the afternoon. Peak gusts near 80 km/h can be expected for exposed areas of coastlines and at higher terrain. Due to the topography of the Highlands, gusts for northern Inverness County are likely to exceed 110 km/h. The increasing winds will combine with snowfall to reduce visibility in drifting and blowing snow though visibility will improve for areas that turn to an ice pellet and rain mix. As the storm passes Wednesday night, winds will turn west and northwest with gusts of 30 to 60 km/h into Thursday morning. The gusts will ease Thursday evening and night. Travel in the region will be impacted on Wednesday. Along with winter weather conditions on the roads, airports and ferry services should be watched for delays and cancellations. 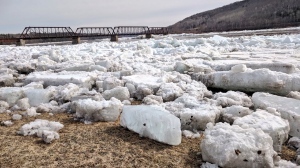 Special Weather Statements have been issued by Environment and Climate Change Canada for all three Maritime provinces. They caution in the statement that weather warnings may be required for some areas and for the public to continue to monitor the forecast. UPDATED: A winter storm is going to bring snow to most parts of the Maritimes on Wednesday. The storm is expected to begin at sunrise.